Home » Chess Pieces » What Are the Pieces of a Chess Board? Chess is an immensely popular game that people of all ages and skill levels will enjoy. Chess has been around for centuries, and even today it is still the most popular game in the world. Learning chess isn’t difficult, but it takes some time to know what exactly all the pieces do and how they can move. The following is an in-depth look at the pieces on a chess board and how they travel across the board and capture opponents. Each player has one king. The King is the most powerful piece in chess, but it is also the most vulnerableâ€”lose your King, you lose the game. The King is typically the tallest piece on the board and wears a crown with a cross. The King can move in any direction you would like to move him, but only one square at a time. If your King gets put in check, you must move the King out of check on your next move. In addition, you can’t capture one of your opponent’s pieces with your King if it would put you in check. The Queen is the most valuable piece in your army. The Queen is usually the next tallest piece and has a crown with points on the top. During set-up, the Queen is placed on her own color (ie, white on a white square, black on a black square). The Queen can travel as many unoccupied spaces across the board that she wants in any way she wants â€“ diagonally, vertically, or horizontally. A queen cannot, however, “jump ” over other pieces. Each player has two rooks. Rooks are shaped like castles or towers and can travel as many unoccupied spaces as they want, either horizontally or vertically. The Rooks are also used in a move with the King called “castling. ” Castling is complicated and usually reserved for tournament play or more serious players. There are two knights for every player. These horse-shaped pieces have a unique way of getting around the board. The knight moves two squares horizontally or vertically (like the rook) and then one square perpendicular to that. The Knights can leap over any piece in their path. 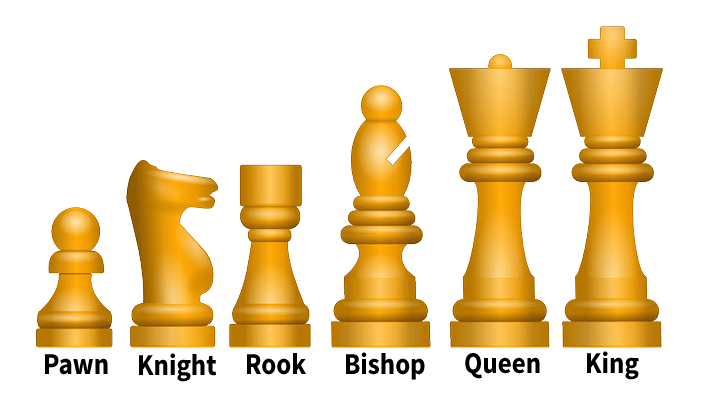 Each player has eight pawns. The pawns have the most rules involved with their movement. Each pawn moves across the board vertically one space at a time. There are a couple exceptions to this: when they are capturing a piece, they do it by moving diagonally to the right of them. Additionally, if it is the pawn’s first move, it can move two steps forward to an unoccupied space. One great thing about the Pawn is that if the pawn makes it all the way across the board to the farthest square without being taken, the player can “trade ” his or her pawn in for queen, rook, bishop, or knight of the same color. Most people opt for a queen, since it is the most powerful piece on the board. If their queen has not been taken, two pawns of the same color signify a queen. All pieces “capture ” their opponent’s pieces by landing on them in the various ways they travel across the board. The exception to this is the pawn, which captures by moving diagonally. Learning the various pieces of chess is the first step in learning how to play.